Product categories of Mobile Cone Crusher, we are specialized manufacturers from China, Mobile Cone Crusher, Mobile Cone Crushing Plant suppliers/factory, wholesale high-quality products of Mobile Stone Cone Crusher R & D and manufacturing, we have the perfect after-sales service and technical support. Look forward to your cooperation! Mobile Cone Crusher is mainly composed of high-performance Cone Crusher, high-performance vibrating screen, Belt Conveyor, electric motor and control cabinet. The whole Mobile Crushing Plant adopts integrated installation and coordinating work, which fully represents its advantages of convenience and flexibility. Tyre mobile cone crusher is suitable to be used in fine crushing field for producing sand and stone products with high hardness and fine granularity. According to the specific needs, the equipped cone crusher can be adjusted to different types of crushing chambers, thus expanding the use field and application ranges of tyre mobile cone crusher. 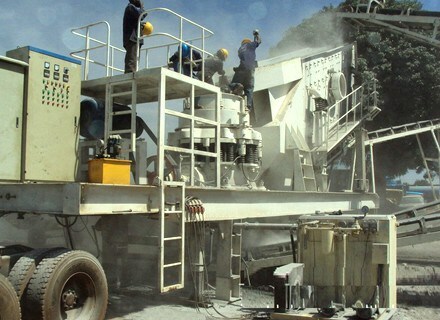 Wheeled mounted mobile cone crusher is widely used in mine, coal and for the recycling and reuse of trash and construction waste as well as urban infrastructure construction, road or construction site, and it is also suitable for the artificial sand making with river cobble, hillstone, mineral tailing and aggregate chips. 1. Tyre mobile cone crusher has such features as high crushing efficiency, light and reasonable structure design and outstanding crushing performance. 2. The crushing cavity can be adjusted, thus expanding its use field and application ranges. 3. The whole Mobile Crusher adopts integrated installation and coordinating work, which fully represents its advantages of convenience and flexibility. 4. Wheeled mobile cone crusher has strong processing capacity and can satisfy the crushing and screening requirement of coarse, medium and fine materials, so that it sets up a good quality reputation for the customers at home and abroad.